Your vehicle's braking system should be at it's optimum efficiency at all times. 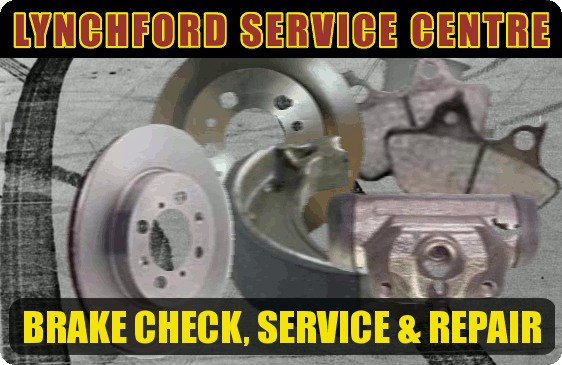 At Lynchford Service Centre part of our service routine, be it small or large, is a thorough check of your braking system. As a brake fitting specialist, we ensure your vehicle is always fitted with the highest quality braking components from either the vehicle manufacturer or one of the leading aftermarket part manufacturers. Why should I have my brakes checked ? It is essential that even if you don't have your vehicle regularly serviced that your braking system is regularly checked. Brake system checks will uncover faults such as perished or split brake hoses, worn brake pads and discs, leaking brake calipers. How long will my brakes last ? With the ever increasing efficiency of braking systems and harder materials being used in the construction of brake pads, it is now quite common for brake discs to wear at the same rate as your brake pads. It is believed that brakes last longer if you do a lot of motorway driving but with the high speed braking required, disc changes may be required at 25,000 miles. Under normal driving conditions brake discs can last up to 50,000 miles. Most manufactures recommend changing brake fluid at a maximum of 2 year intervals because brake fluid absorbs moisture from the air. The water in the brake fluid causes the fluid to boil at a lower temperature, therefore reducing it's efficiency. If your brake fluid boiling point is low it may cause brake fade or in some cases brake failure.